WHY DO YOU NEED AN OFF PAGE OPTIMIZATION? On page optimization is taking care of your web page which will make your site rank in search engines. While Off page optimization is all the possible ways which can be taken care of outside the webpage to improve your search rankings by accumulating backlinks, content marketing, getting your posts viral and in turn gaining trust and credence in search engines eyes. If you want to rank your posts well in search engines then off page SEO techniques is the only answer, as Google and other search engines pay a lot of importance to backlinks and trustworthy sites. 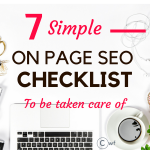 Here we go with the off page SEO checklist for digital marketing. When Google finds that many sites are linking to your website then it feels that your site must be important. When higher authority blogs link to your site then it makes Google think that your site is very important and thus your post should be ranked well in search results. In order to get good search engine visibility, backlinks play a vital part of the most important role in getting your posts ranked. Making other websites link to your site is known as link building. Links are considered as votes in the search engine world. When many popular and trusted sites votes for you then your site also becomes popular and acquires some weight-age. How to get some valuable backlinks? Backlinks are the links of other websites directing to your site. 1. One of the best ways to get natural backlink is by writing extremely good posts. When we write extremely good posts then it is natural for people to link to us. For example: When it comes to Search Engine ranking factors, I always link to Google’s 200 Ranking factors by Brian Dean. As it is the most detailed researched post I came across. So when you put some exceptional post, it becomes natural for people to link to you to enrich their article. 2. Another simple way to get backlink is by commenting on high authority websites related to your niche. A simple calculation: If you comment on a single blog each day then you can have 30 backlinks in next 30 days. But there lies a problem i.e. most of the blogs have ‘rel=nofollow’ notation. Which means they would not pass any link juice to your site and hence it will not improve your off page optimization SEO. In good old days, even the no follow backlinks had weight-age. But in 2017 with fierce competition from millions of blogs, Google will not pay that much attention to your blog even if you manage to acquire 1000’s of no follow backlinks. Check the sites which use Commentluv plugin. You will get numerous list of sites in Google when you search for ‘Dofollow Blogs’ or ‘Sites using CommentLuv Plugin’. Such Sites will pass link juice to your site (when you comment on them) and hence it will be a positive factor for the off page seo techniques. 3. How can I forget Guest Posting? Guest posting on high authority sites not only will give you a do-follow backlink as well as you will get plenty of targeted traffic to your site. Make a point to guest post at-least 5 articles in a year. The more the better exposure of your work. Just a Tip: Never buy backlinks. You may find sites offering you 500 backlinks for 10$ or so and so. They are not only useless in 2019 as well as they may give a negative seo for your site. Check the Positive and Negative SEO Factors. Article marketing improves your organic search results. Article marketing also helps you with incoming links (backlinks) to your site as well as build your reputation. When you do article marketing for your posts in top sites then it adds to additional targeted website traffic. Before the onset of Digital marketing, article marketing was the most popular way to market your blog as well as to establish yourself online. Even in current time article marketing is valuable. Top article marketing sites contain quality posts which you will not find on any social media. How to do Article Marketing? Here you need to do a bit of extra work as you will be required to write an additional 500-600 words post in the article marketing sites. For article submission always write an original post linking back to your related blog post. Though there are some sites which accept blog posts but it is not safe to copy paste your blog content as that will result in duplicate content issues. Hubpages have more than 20 categories of pets and animals to technology. Hubpages articles are itself entitled to contain ads in them. You can also do affiliate marketing on your hub pages post. Needless to say that Hubpages is a way of earning for many even if they do not run any of their own blogs. Ezine articles have more than 30 article categories. Every article in Ezine is reviewed twice before getting published. EHow is about crafts, Food and drink, Fashion and beauty and related categories. It is a beautiful site to get featured and get targeted traffic for your post. Article Cube allows post from Business, Entertainment, Food, Health, Home and Technology category. An article marketing site to post about business, startup, finance and related niche. Are you ignoring digital marketing in 2018? Social Media is so so huge now. You can drive over a million targeted visitors from social media itself. If any of your posts go viral then you can have a number of re-shares, re-tweets, re-pins which in turn will give you numerous backlinks pointing to your site. Though social media backlinks are in general of no follow notation but check out if social media backlinks affect search engine rankings? You can create high-quality backlinks from each of your social media accounts. Apart from FB, Twitter, Instagram there is Tumblr, weheartit and other such sites which allows you to put your web address in your profile to get you a backlink. Social Media is very useful for off page seo techniques and to grow your business. 4. HAVE YOU HEARD ABOUT SOCIAL BOOKMARKING SITES? Social bookmarking sites are one of the decent ways for off page seo techniques. You can promote your website on social bookmarking sites and manage to get high traffic to your blog considering how popular the social bookmarking site is. How does social bookmarking sites work? Have you ever tried with 80/20 or 70/30 rules for content marketing on social media sites? Social bookmarking sites work in the same way as you would do content promotion on social media sites. You need to be very active here, responding to comments, be humanely present. Have a good complete profile saying what do you blog about to attract the correct kind of people. Always share quality content from your site as well as from other people’s site which can help your followers seeing some informative articles, other than populating their feeds with crappy posts. StumbleUpon is a powerful traffic generator. You will find here much interesting content and a wide range of categories to submit your post. Digg is a site with domain authority 80. You can expect a good amount of traffic if your content is shared by other dig users and voted up. In Flipboard, you can create visual magazines of any category and showcase your blog content as well as others. Flipboard magazines are visually attractive and can easily be accessed with smartphones. Flipboard works great when your profile is completed and you are having 5-6 magazines relevant to your industry. When someone votes up your content then it is counted as sugars. If any of your posts get viral then you will get the opportunity to be featured on their homepage which will result in huge traffic. Reddit is having a Global rank 9 with its huge user base. Many businesses drive a tremendous amount of traffic from Reddit itself. But there is a catch in using reddit as you will not be able to post your content directly as most of them will be marked as spam and hate comments from other users. Spend time in reddit to understand what is karma and how to use it to drive traffic to your blog. My personal recommendation would go for Stumble Upon which covers all sorts of categories. Make use of the do follow forums. Do follow forums not only will give you a do follow backlink but you can also build a community with like-minded people. You can take part in forums and have your queries solved related to your niche, reply to other people’s question, give suggestions, refer to other articles as well as yours. If you can solve other people’s query in an efficient way then it will lead you to enough blog traffic. Site owners forum gives detailed info about SEO, Fiver, Backlinks and related niche. If your niche is based on these then this a good forum to gain knowledge. Cnet forums category ranges from Hardware, Tablets, Electronics Gadgets and others. In each category, there are plenty of discussions where you can participate and have a backlink as well as drive traffic to your own site if your blog is related to. Warrior forum is a very active forum with categories of internet marketing, programming, social media, email marketing and related niches. Digital forum offers a wide range starting from HTML, Graphics, Programming to Buy sell or trade, Business and marketing and Legal issues. As the name suggests it is definitely a community about affiliate marketing but it also provides categories like Research and Intelligence, Domain & Hosting, Traffic sources, and others. Most of my do follow links are owned by Site owners Forum. Question & Answer forums are very effective tools in building your own community. You can join high DA forums to answer queries related to your blog and putting link backs to your own website for further more information. Q/A forums bring visibility to your profile as well as your blog. Many websites too have their own Q/A forums. You can join a number of forums to drive traffic to your blog. Not all website will allow you to link back to your own blog. When it comes to Q/A forums, no one can replace quora. It is such a huge resource for any kind of information. Be it any category quora is always there to solve. Even if you do not want any traffic from Quora, still I would recommend you to sign up as it is a very helpful community. Prior to social media, it used to be number one resource for many bloggers to drive potential traffic. In the current arena too, Yahoo Forum is pretty much active with a varied range of category. Yahoo is having such a huge user base that per millisecond a new question pops up. Its category ranges from beauty-home-garden-technology-work and money. You would get covered here for every possible ques. Its category ranges from data science-DevOps-drupal-Ebooks- electronics and related. If you are running a blog related to these niches then stack exchange will be very beneficial to you. You can ask queries and expect it to get solved within minutes as it is a highly active community. Moz provides excellent SEO tools. Apart from SEO service, Moz holds up a Q/A community. You can get professionals solving your queries here. It is a splendid community for SEO and other related niche topics. Video sharing is the most powerful way to drive traffic to your site as well as to establish yourself. You can build a social reputation by directly speaking to your users through video tutorials. Video sharing is an exceptional way to off page optimization. Neither YouTube needs an introduction nor any explanation. There are YouTubers earning millions from their Videos as well as bloggers driving crazy traffic from YouTube itself. In Vimeo, people generally post short videos related to their own blog and linking back to their own sites. Daily Motion is similar to youtube where people watches movies as well as other informative videos. You can upload videos related your blogs to drive traffic. The break is especially for entertainment websites. You can post funny videos and pictures and also drive traffic to a related site. Flickr is much known for its photo sharing. But Flickr also provides video sharing opportunities, where you can upload 2 videos each month for free and unlimited videos for paid membership. Guest blogging is one great way to get some high domain authority backlinks. When you are guest blogging on popular sites then you an getting a rich exposure and traffic to blog in return. What should you check before you Guest Blog? Always be sure you are guest blogging in your niche. Check if the blog has an engaged audience who will be the audience for your guest blog too. You have a great opportunity to turn your audience into subscribers, so give your best shot as a guest blogger. Check if previous guest blogger’s posts are shared on their social media accounts. Then your work will be shared too. Building your brand is the most efficient way to success. Not only for off page optimization but when your website is branded it will give your readers a feeling of contentment. Check out the top bloggers. You will find they are consistent in their way of preaching. What makes most of the authority bloggers branded? A personality which comes up through blogging (Mostly their own-self personality). Be consistent in your work and always deliver meaningful articles to your readers which will ultimately give exposure to your online existence. Last but not the least is collaboration, my friend. You want to grow your blog then nothing can beat collaboration for your business exposure. You can collaborate with someone who is in your niche yet offering different products. When I speak of collaboration do not get confused about blogging together. It means you can hold up webinars, live session or video series together. Collaboration gives much more exposure as both of your audiences will be present. So it is a Win-Win situation for both the bloggers as well as the audiences as they are going to learn something new from both of you. I am a part of a beautiful and active community called Billionaire Blog Club. If any day I need blogging advice or collaboration, am sure I am going to get it there. In-fact BBC is not only a community but has courses starting from SEO, WordPress, Google analytics to Pinterest, course launch, email marketing and everything you can ever need for blogging. No that does not mean you have to get in this community to have blogging success. On page Optimization follows a set of rules so it is easier to do. You can check out the Top 7 On page SEO Factors. But off-page SEO is tougher and it determines the position of your blog in search engine rankings. With proper off page seo techniques, there should be no limit to website traffic. Ugh backlinks! Something I really don’t understand- thanks for the breakdown! If you are using social media for promotion then well and good. 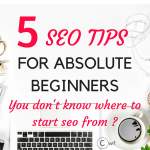 But If you want your blog to come up in search engines then my dear you need to know at least the basics of SEO and backlinks. Hey Nicole thank you for your words. 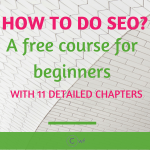 This is such a great guide and I know I have to work on my SEO! This will help me for the future thank you for putting it together! I didn’t even know about all those article marketing sites. You covered the best information regarding off page SEO techniques. I hope you will publish total info on Backlinks next articles. Thank you for sharing this article with us. The Good Article I have to Follow all Steps. I want to Know How many updates Backlinks. It will take 30-45 days for search consoles to update your backlinks. Ahrefs, Semrush generally takes 60 days to update the backlinks. Just for a suggestion: Do not have to count how many backlinks you have. Just keep on building links. You have explained it very neat and clean..You nailed it bro…KEEP UP your gud work. You must join at-least 3 to 5 forum related to your blog niche in order to get benefit from forums. The main purpose of forum posting is to get free instant traffic for your website and when you got some respect in forums than you can add your blog link in your signatures. Many forums allow your blog link to be do-follow which means full link value. You can very easily find a forum related to your blog niche by searching the keyword with Forum like “WordPress Forum” etc. What is the difference between off- and on-page SEO? 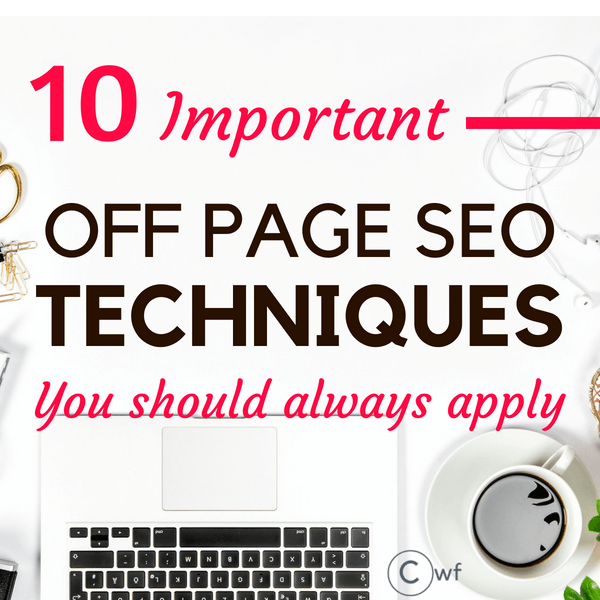 Hello Regex, I would like you to go through the on page seo factors https://www.coolwebfun.com/on-page-seo-checklist/ to see the difference between the off page and on page seo.